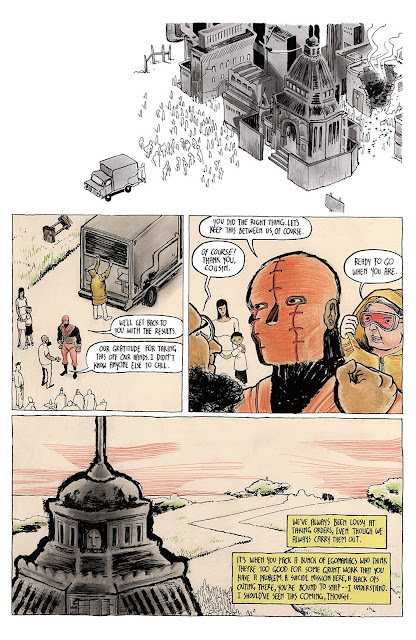 My introduction to the work of Michel Fiffe was rare in these modern times, in the sense that I first heard discussion of his amazing comic Copra online, and in a podcast. But I couldn't get a hold of it. The issues weren't widely available in comic shops, and the issues weren't available online yet. But I'd heard the buzz, and heard people talk about just how got of a comic it was. And I was excited that in these times there was still something that felt legitimately "underground". I did finally get my hands on some Copra. And all the praise I'd heard about the book? Completely justified. Copra is a truly great, highly entertaining comic about a badass squad of mercs/villains (i.e., Suicide Squad). And it absolutely works on the level of homage and nostalgia; if you're a longtime comics reader, you'll recognize and appreciate the characters that are Marvel and DC analogues. However (and more significantly), even if you're not familiar with the characters (and I wasn't really, when I first started reading Copra), this is still a terrific, engaging book. Fiffe does everything on this comic (script, pencils/inks, colors, letters) and the amount of detail on each page is just stunning (and appears to be hand-dawn and lettered). That Fiffe is able to keep to a basically monthly schedule is a highly impressive undertaking. 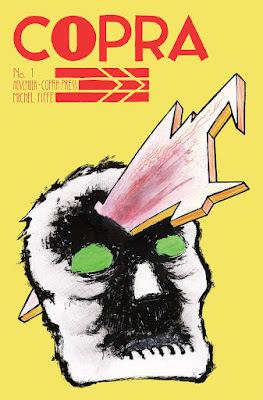 Copra may be an homage to 1980's action comics such as Suicide Squad, and the character design has significant nods to existing Marvel and DC characters, but the artistic design of this book feels like a unique, singular vision. It still looks like nothing else I'm reading. To start, the sequential storytelling in the book is exemplary, as each panels flows one to another. Given than many of the pages have no dialogue, this is a necessity (and that level of visual storytelling is not a skill all artists have). There are a number of multi-page fight sequences that effectively convey the power, speed and motion of the fights between the characters. Fiffe also effectively conveys the brutality in these settings; when one character smashes another in the chest, you can really feel it. Fiffe accomplishes this both with dynamic lines but also with creative lettering, which has variety and depth and adds to the effect of the scene (as the sound effects become part of the art). He also takes the additional step for certain characters to use unusual word balloon borders, to convey the alien, odd nature of the character. For character design, while many of the characters will feel familiar (Deadshot, Doctor Strange, Doctor Light, Punisher, Nova), each of the designs has been prepared with a great deal of detail and care. Unlike many typical superhero comics, each of the characters has a completely different, easily distinguishable look, feel, physique and set of facial expressions to them. While the art in the book is highly stylized and the facial details somewhat minimalist at times, the facial acting and body language are very effective at conveying everything a reader needs as to the emotions of the characters. Backgrounds are generally rendered in a minimal style, but Fiffe puts the detail and energy where it needs to be in the story. If there's particular detail in a background, you get the sense that it's there because it needs to be there. The general story elements will feel reasonably familiar to superhero comics readers and fans of the action movie genre. There's combat, betrayal and revenge. 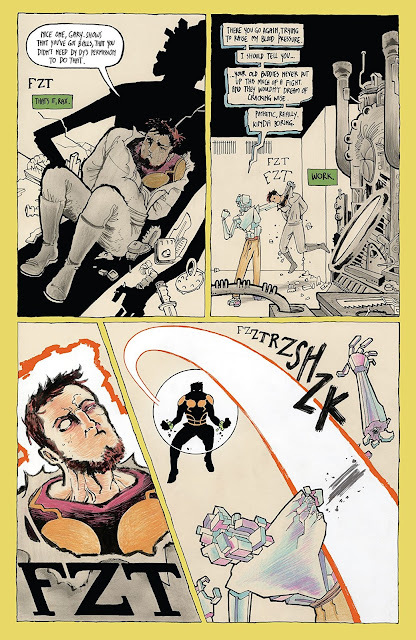 What brings it all together and elevates the book (in addition to the art) is that while Fiffe hits many of the typical genre tropes of this kind of (action, superhero revenge) story, he does so in a way that feels knowing and entirely serious, with humor and without irony. The pain, and heartbreak, and anger of the characters all feel entirely real, rather than simply feeling like some sort of self-refrential homage. 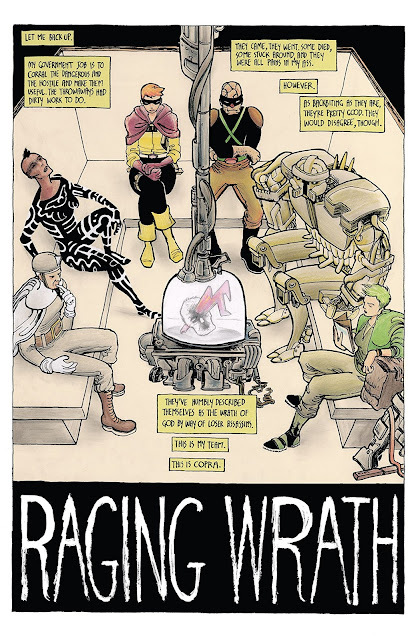 The character interactions (and tensions) among this group of tough customers are also quite compelling, and all of this adds up to make Copra a terrific read. Fiffe will next be taking on a re-imagining of Rob Liefeld's Bloodstrike. I must confess, I've never read the original. But if Michel Fiffe is creating the comic? I'm there, and you should be too.